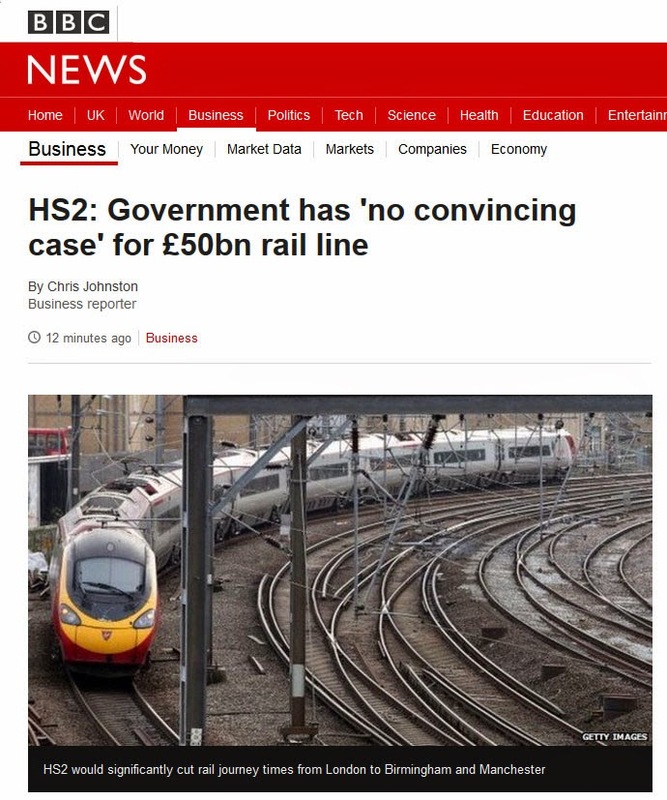 "The government has no convincing case for spending £50bn building the HS2 rail link between London and the North, a report by the House of Lords Economic Affairs Committee says. There are less-expensive options than HS2, they said on Wednesday. Lord Hollick called on the Department for Transport to provide detailed answers to the questions set out by the committee. "Parliament should not approve the enabling legislation that will allow HS2 work to begin until we have satisfactory answers to these key questions," he said. The peer sets out arguments against the investment in a YouTube video..."
For Red Nose Day and Myton Hospice, Lucy Cotton who lives on Cromwell Lane and a few of her friends Courtney, Chloe and Jack, baked cakes and sold them around the houses of Burton Green. 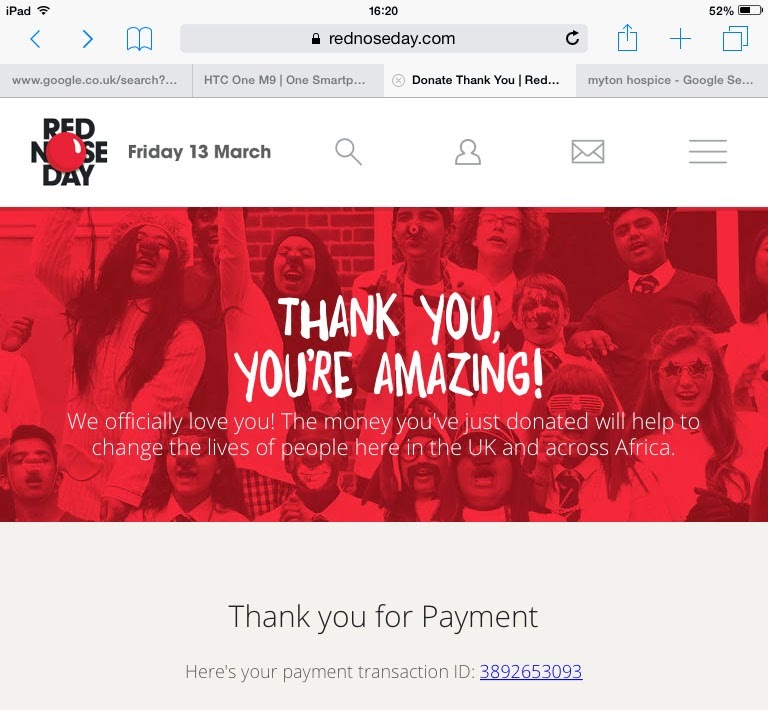 Thanks to the generosity of everyone, they managed to raise £14.00 for Red Nose Day and £21.11 for Myton Hospice. Andy Gibbs; Alice Hawkins; Terry Heyes; Judi Hibberd; Janet Hickinbottom; Bron Putnam; Diane Swindells Rona Taylor; Faith Ward; Mary Webb. Allan would be asked about organising a broadband event in the autumn. As the Village Hall could not access broadband an alternative venue would be needed. Mary submitted the link to show the rollout of Broadband. Terry had been in discussion with Cllr. John Whitehouse and could report that WDC would pay half the calibration costs for the Speedwatch equipment. Vaughan warned that boundary changes might have an impact in 2017/18. Rona had also spoken to Cllr.Whitehouse about traffic matters. She would follow this up and Judi would send resulting information to be circulated on the email loop. Continued discussion took place regarding the change of priority on the Cromwell Lane bridge, with varied opinions. It was suggested that a slow sign could be erected on the approach from the Hodgetts Lane end. Ongoing monitoring was agreed and Rona would cover the topic at the AGM. Traffic around the University was still a problem as works continued. The Poultry Farm work was continuing as it was deemed to be within planning rules. Broadwells: the planning committee had backed up the enforcement order. Cllr Owen said the appeal could last a year. Terry reported it had been a very quiet period with the exception of receipt of funds from the Mine Opposition Group. The remaining funds raised in the 1980s had now been refunded in proportion to the amount originally contributed. Almost £1k had been brought in from subscriptions this year. Retired lunches: 7 had been held over two years and have made a £300 surplus. This worked out at an approximate £1 per head profit. Terry suggested that a sum be held in abeyance to cover the annual deposit for Jubilee Committee events. This was agreed in principle. Another problem was blocking of pavements by incorrectly parked vehicles and PC Trent McMurray had advised ringing 101 to report obstructions. It was accepted that the committee had a good understanding of residents' concerns but was not always sure how to tackle the problems. It was suggested the Greenway Trust needed to consider the parking issue too. • Speedwatch. Trent said some funding had been available for police to monitor the new speed limit but this information had arrived just as the funding stopped. Terry said the Speedwatch team had been doing monitoring but proper recording would take place soon. • Welcome Pack. Amendments were still being added. Chris Langton and Deirdre Vernon had offered to distribute the packs. Chris Langton has added comments. Further suggestions were to add that the Bugle was part funded by residents' subscriptions of £3 per year. 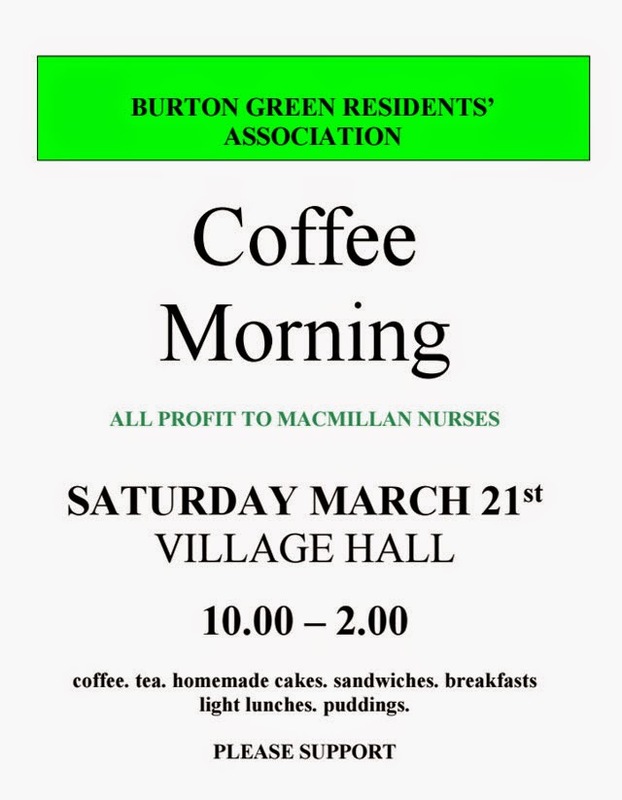 Details of Burton Green congregation should be included. Information should be updated annually. Judi would amend and pass a very small number to Chris and Deirdre. • Feb 19th event with over 40 attendees and the next one was scheduled for May 28th. It was acknowledged that this provided the only daytime event of its kind in the village. • Circus event. This was scheduled for June 20th. Everything was in place. Hilary was doing the tickets and Ian printing for free. A poster had been emailed extensively. It was agreed to use the term “circus skills” in future promotion. • Broadwells – Covered under Matters Arising. • Bugle. The next edition was at the printer's. A competition for children would be included. Any other ideas were welcome for future editions. Thanks were given to Mary. • Bridge – monitoring of re-direction. Covered under Matters Arising. • Heart Start. On April 24th a free refresher course was to be offered at the village hall. • Broadband. Covered under Matters Arising. Mary reported that the defibrillator battery had been checked but it was decided this was an unnecessary cost in the future as Alice said self-checking was easy to do. Rona felt BGRA was doing well and moving forward with the targets. The targets would be checked at the next meeting. The Village Hall committee had held a lengthy meeting with HS2 and had considered the site they have put in AP2. Potentially the current hall might not have to be vacated until 2018. Another architect was to be interviewed and one would then be chosen. A meeting was to be held on Friday March 20th. 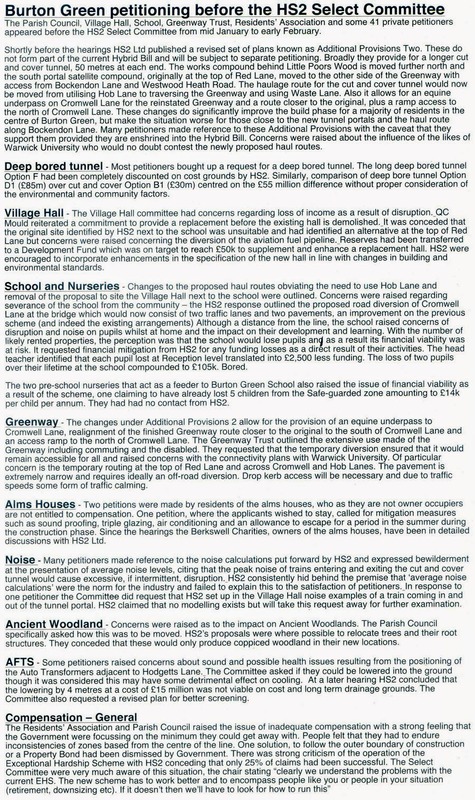 HS2 had booked the Village Hall from 1 to 8p.m. to find out people’s views. A formal session would take place between 5 and 6. Three small presentations would be made based on a vision for the future drawing on residents’ opinions from the parish plan and previous surveys of residents’ views. 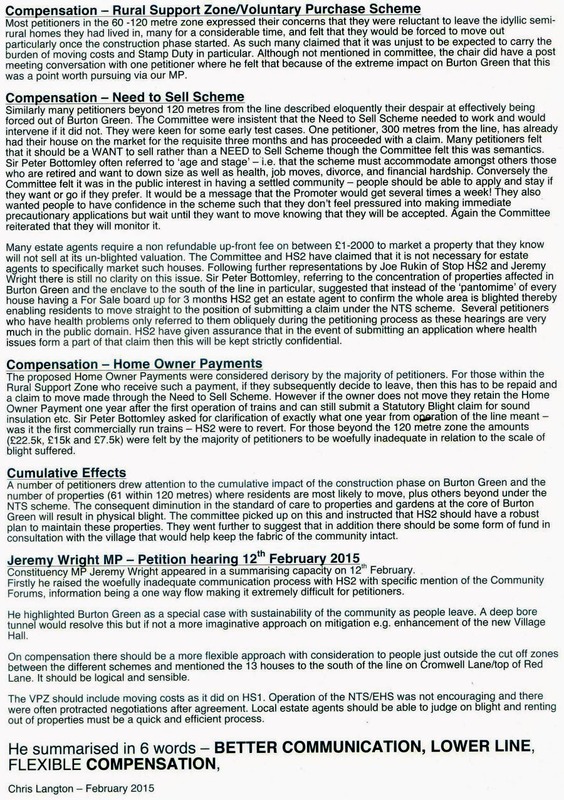 The HS2 engineer would highlight issues raised by residents during day. Jeremy Wright MP was to be present. Residents would be urged to consider what they wanted, how this was to be funded and how sustainable it might be. HS2 had promised a visual representation which as yet had not materialised. Sunday May 17th: a Bake Off event was to take place combined with a treasure hunt. Andy reported that petitions were still being heard but the sessions would end soon before parliament went down. He urged questions to be asked at the March 20thmeeting to find out what was on offer after Burton Green’s petitioning. Those people who had petitioned had received information on AP2 but others in the village had not. There was a need to remind HS2 of matters raised by petitioners. Rona said she had written to Jeremy Wright, at the request of the action group, to ask when there would be a response from the Select committee. Cllr. Owen spoke about changes to the ward boundaries and the inclusion of the University in the Burton Green Parish Council. There were places on the Council for 4 University councillors and 7 Burton Green councillors. Residents were recommended to go to the Parish Council website to find out how to become a councillor as more volunteers were needed. 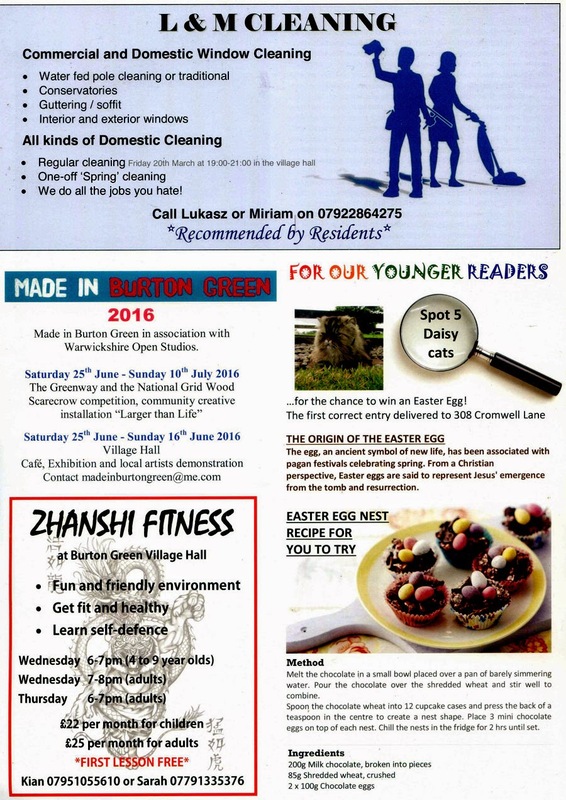 See http://www.burtongreenpc.org.uk/ or http://www.warwickshire.gov.uk/parishes . Elections would take place in May. Further details would be provided in the Bugle. New noticeboards made of man-made materials had been ordered by the Parish Council. One was to be erected in Red Lane but there was still some uncertainty over its siting. The other was to replace the Cromwell Lane board. Terry was willing to refurbish the old board and to use it at his property for the purposes of displaying Neighbourhood Watch materials etc. The outcome of the noticeboards’ siting was awaited following the Parish Council’s decisions. 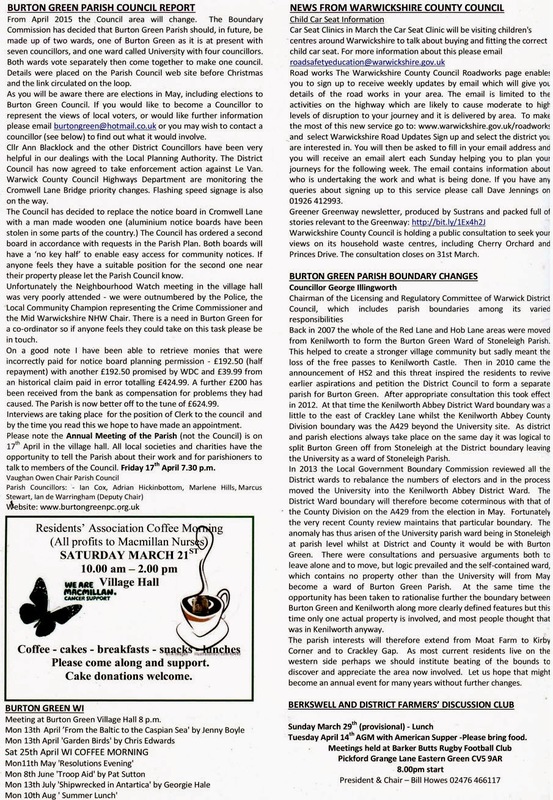 The next Annual Parish meeting was scheduled for April 17th should be circulated to ensure residents realised this was not another Parish Council monthly meeting but an event at which residents could air their views. The Parish Council had held a Neighbourhood Watch meeting which was very poorly attended. Instead, the information had been provided at the start of one of the Retired of Burton Green lunches. A new parish clerk was to be appointed and would be in post from April 1st. Flower tubs for Red Lane were to be planted up. A coffee morning would be held on Saturday March 21st for cancer research. 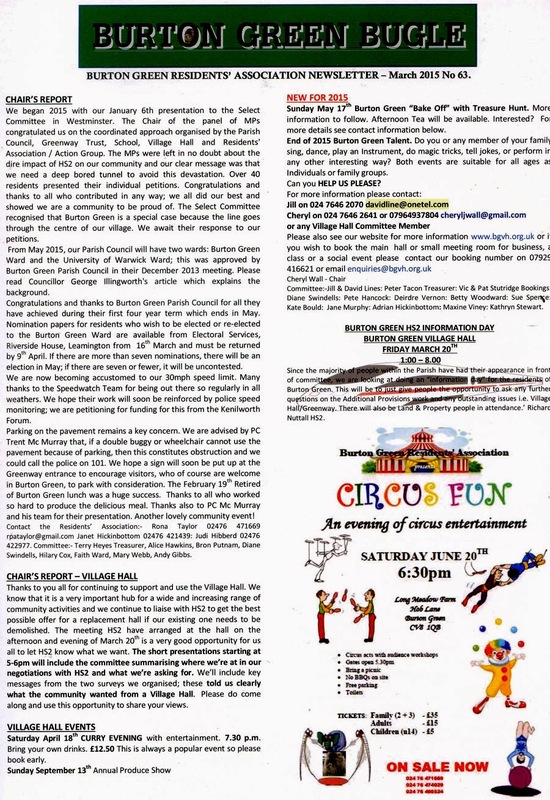 The next committee meeting would take place on May 5th at 7.30p.m.at the Village Hall. 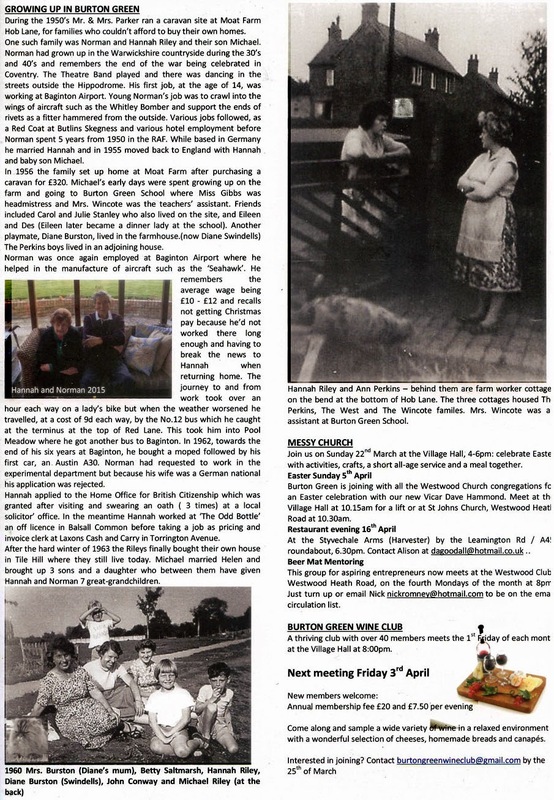 The March 2015 edition of the Bugle has been published. Dates for Made in Burton Green in association with Warwickshire open studios. Please note that we are NOT taking part this year, 2015. These dates are for next year. Saturday June 25 - Sunday July 10, 2016 along the Greenway and the National Grid wood. Scarecrow competition, community creative installation larger than life etc. Sat. June 25-Sun. June 26, 2016, at the Village Hall. Café, Exhibition and local artists demonstrating. More details later this year. A not for profit drop in group meet in the Green room at the VH weekly [£2]. Any level of experience, sewing machine available, help on hand for clothing and soft furnishing by retired teacher if required. Please note we will not be meeting July and August.